The TS Government has finalised the exam scheme for Government jobs to be notified by TSPSC. For Group-1 and Group-2 post additional paper about the Telangana movement and State formation added to the scheme of examination covering three sub topics. a) The Idea of Telangana (1948-1970) b) Mobilisation phase (1971-1990) and c) Towards formation of Telangana State (1991-2014). 2. History and cultural heritage of Telangana. 3. Geography of India and Telangana. 1. Indian society, structure, issues and social movements. 3. Development and enivronmental problems. 1. The role and impact of science and technology. 2. Modern trends in application of knowledge of science. 3. Data interpretation and problem solving. 1. Socio-cultural history of Telangana and formation of Telangana State. 2. Overview of the Indian Constitution and politics. 3. Social structure, issues and public policies. 2. Economy and development of Telangana. 3. Issues of development and change. Majority pf the people were waiting for this moment and finally telangana government issued the australian assignment help syllabus for those students who have applied for the jobs in government sector. Thanks for the nice informative page. 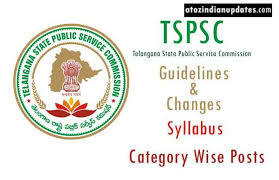 Could you please help me by sharing the latest updates in TSPSC Syllabus . If you can then please provide me some etails related to examination pattern to.